Visit The London Eye (also known as the Millennium Wheel or the British Airways London Eye) with the Amateur Traveler: This video shows a view of and from the London Eye as well as a few of the sites near the London Eye like the Parliamentary Clock Tower (Big Ben) and the statue to Queen Bodica. London eye tickets start at 17 pounds for adults but offer a good view of Westminster, the Themes and that general area. At 443 ft, the London Eye is the largest ferris wheel in Europe (The world’s tallest Ferris wheel is in Singapore – the Singapore Flyer). 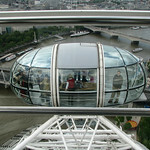 The London Eye revolves once each half hour so you get a slow leisurely view. Great shots of London. I didn’t know that the London Eye rotates very slowly. Interesting…London is a fabulous city. They’ve gotten a bit “crazy” lately with implementing some strict guidelines for taking photographs, but hopefully they’ll snap out of it!